Citigroup posted solid third quarter results Monday morning. Citigroup's third-quarter profits and revenues exceeded expectations, yet the bank did not see the same lift from the boom in mortgage refinancing as its competitors. The performance of most divisions of the bank improved from a year ago, including investment banking, stock and bond trading and the bank's consumer business. Shares rose more than 4% in afternoon trading Monday on the news. Citi's stock is now up nearly 37% in 2012. The bank said that revenues from new mortgages and refinancings increased its retail banking revenues by 6%. Still, Citigroup's chief financial officer John Gerspach admitted that the bank was slower to catch the wave of refinancings and new mortgages that boosted sales and profits at competitors JPMorgan Chase and Wells Fargo. "We did not staff up as quickly as we otherwise could have," said Gerspach during a conference call with reporters. Mortgage originations dropped by 15% from a year earlier to $14.5 billion. Gerspach added that he's unsure of whether we're in the midst of a viable recovery in the housing market. "We're all seeing some elements of stabilization," said Gerspach. "But there are still significant challenges to be faced. In the past, we've seen some of these periodic improvements only to see them crashing down." Gerspach also took issue with the rosier view on housing offered by JPMorgan Chase CEO Jamie Dimon. Last week, Dimion said that "the housing market has turned a corner." But Gerspach said, "I don't like phrases like turned the corner. I have difficulty seeing corners." Citigroup (C) reported a net profit of $468 million. But that included charges tied to a $2.9 billion loss on the sale of its remaining stake in brokerage Smith Barney to Morgan Stanley as well as a $485 million loss on the value of the bank's debt. Oddly, the bank is forced to take losses when as its credit improves. Yet, the bank boosted its profits by releasing $1.5 billion that it had set aside to protect against losses from loans. Excluding those items, the bank earned $1.06 per share on $19.4 billion or revenues. Analysts had expected the bank to generated profits of 96 cents a shares on $18.05 in revenues. Citigroup's revenues increased 3% year-over-year. CEO Vikram Pandit said he expects revenues to increase 4% to 6% in 2013. Citigroup's CFO noted that loan growth in the bank's Asia division had slowed, particularly in Korea and Japan. In Korea, Citigroup booked a $20 million loss from restructuring its business units and expects to take further "repositioning charges" there in the fourth quarter. But Gerspach noted that some of the lending slowdown in Asia was offset by growth in Latin America. "That's one of the benefits of being as diversified as we are," he said. Still the bank's positioning in Asia could help Citigroup continue to land investment advisory work for global mergers. Pandit predicted an increase in Asian companies buying North American companies. On Monday morning, Japanese tech company Softbank announced the purchase of a 70% stake in Sprint (S). Citigroup advised Sprint on the $20 billion deal. 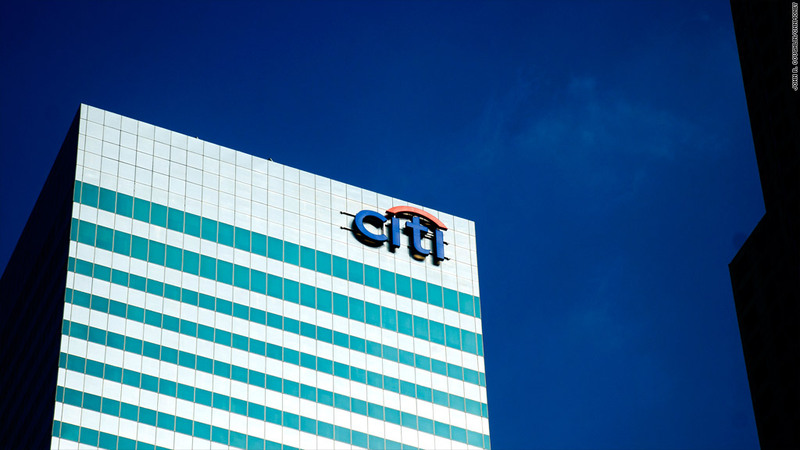 Fees on that deal should bolster Citi's investment banking earnings for the fourth quarter. In the US, Gerspach called the recovery "weak," citing the fiscal cliff as a key inhibitor. "We are still facing a great deal of uncertainty." Meanwhile, Gerspach declined to comment on what steps the bank's board of directions might take to alter its executive compensation plans. In April, shareholders voted down CEO Vikram Pandit's $15 million pay package. Citi is the third big bank to report earnings for the third quarter. JPMorgan Chase (JPM) and Wells Fargo (WFC) both reported solid profits last Friday. Goldman Sachs (GS), Bank of America (BAC) and Morgan Stanley (MS) will report earnings later this week. Bank stocks were mixed Monday despite Citi's results. JPMorgan Chase's stock was up slightly after falling on Friday. But shares of Wells Fargo dipped again Monday following losses on Friday as well.